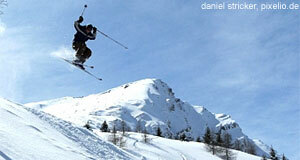 The skiing town of Obertauern can be found in the very south of Salzburg province. Although most people believe that Obertauern is a mucipality, it is actually a hamlet that belongs to two other communities: Partly to Tweng, partly to Untertauern. But Obertauern is not a real village anyway: For centuries, it has been an impoverished settlement in the middle of the Salzburg Tauern Mountains; with the development of skiing in the early 20th century, the economic prospects of Obertauern and its inhabitants rocketed away. Today, the skiing tourism of Obertauern is the financial powerhouse for an entire region. Going there in the summer might reveal the full dimension of this: Then you see the enormous, yet abandoned skiing hotels everywhere. In winter, however, Obertauern comes to life - and what a life it is: Partying crowds from Northern Europe meet families with children who just learn how to ski. The grand attraction of Obertauern is the so-called "Tauernrunde", a line of skiing lifts that allows people to ski "around" the village - along the mountains that embrace Obertauern in a rather unusual manner. The Tauernrunde has been well-known in the world of alpine skiing for quite some time: In 1965, the British pop-band "The Beatles" filmed scenes for the music video of "Help" in Obertauern and on the slopes surrounding it. The slopes of Obertauern can be found on altitudes between 1,630 and 2,500 metres and because of this, the skiing season lasts an impressive 160 days - in ordinary years from late November to the beginning of May. There is a total of 100 kilometres of slopes in Obertauern, available at all degrees of difficulty: 56 kilometres are designated as suitable for beginners, 35 kilometres for advanced skiers and approximately four kilometres of "black slopes" for borderline skiing professionals. 26 ski lifts and cable cars in and around Obertauern allow the transportation of some 40,000 skiers and snowboarders per hour. Obertauern′s après ski scene is rather wild, yet, it is also popular for people who have a more serious interest in skiing as a sport. Families with children are often Austrians who come as day-skiers and do not stay overnight. Therefore, hotels in Obertauern have targeted younger and wilder people, not dissimilar from places such as Ischgl in Tyrol. One strategy was to establish rowdy events such as live concerts in Obertauern; another one, to organise "trendy" sport events, such as skite skiing (skier holding a skite that assists him in breaking his limbs). Another attraction ideal for a younger crowd are the floodlights that illuminate slopes for night skiing and tobogganing. Note that Obertauern is among Salzburg′s busiest skiing areas, rivalled only by Saalbach-Hinterglemm; the slopes of Obertauern are among the best in the province, but for authentic skiing culture and off-the-beaten-track skiing, Obertauern is not the best place. If you look for exciting mainstream skiing or an easy skiing-day-trip from Salzburg, Obertauern is a rather good choice. Obertauern is well-connected with Salzburg via the snow shuttle bus and other private bus shuttle connections. Just ask at the Salzburg tourist information centre or your hotel for the time tables.